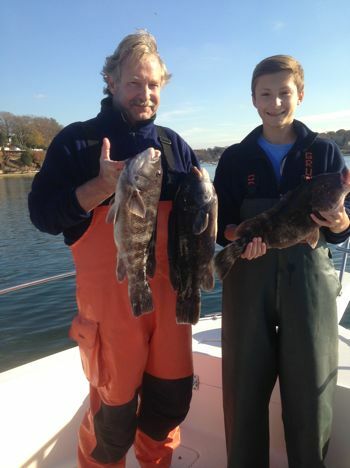 Free Fishing Reports > Northeast > New York > North Shore > Team Schedler Had a Blast Blackfishing near end of our season !!! Capt. Skip and Don finally got Don’s son Dillon out for his maiden voyage to the Blackfish grounds. New to the Blackfishing thing, Dillon listened to all the pointers given, and put on a clinic, out fishing his father 3 or 4 to 1. The crew limited out and had some great meals to bring home…On the father/son front…Dillon (1)…Don (0)… thanks for a fun day guys !! !